You are here: HomenextCity InsightsnextWhen is a 'lane' not a 'laine'? In ancient times there were once five fields surrounding the old town of Brighton. They were called Hilly Laine, Little Laine, West Laine, East Laine and North Laine. The word ‘laine’ is Anglo-Saxon in origin and refers to the feudal system of agriculture which divided open fields into furlongs, which were then subdivided for the sake of ownership, into strips.The North Laine of today takes its name from the field that was once situated to the north of old Brighton. Now, if we are to take notice of the recent sign on the side wall of number 12 Bond Street, it would appear we also have a ‘Bond Street Laine’. It is a fact that a great many of the general public are often confused by the difference in meaning between the simple term ‘lane’, and the ancient term ‘laine’. This latest gaffe in signposting is surely going to add to that confusion. Sadly this mis-naming cannot even be put down to a simple error or misspelling. It was suggested in 1981 by the developers who laid the footpath, which gives access to housing above the shops, and the Church Street car park. The then Borough Engineer endorsed the name, and in the final act of this comedy of errors, the Highways and Transport Committee accepted it. The Brighton Society has started an epetition on the Brighton and Hove Council website asking for support to lobby the council to revisit their decision on this erroneous naming. Please consider taking the time to sign it and support their request. You can find the petition here. Great post! It had occurred to me in the past to wonder about the differentiation between a “laine” and a “lane”, and this is now fully explained – my thanks. 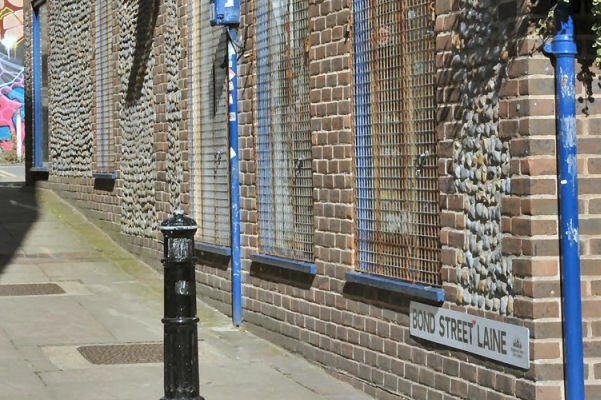 Brighton & Hove City Council will re-name Bond Street Laine into “Bond Street Lane” if no-one objects. If anyone does object, the magistrates will decide the matter. Objections to the re-naming have to be lodged in writing at Brighton Magistrates’ Court (Edwards St, BN2 0LG) within 21 consecutive days after April 27th viz: by May 18th . Re-naming a street is normally only considered as a last resort when changes occur which give rise (or are likely to give rise) to problems for the Emergency Services. In this case, the only reason being given by a local historical society to change the street name is that it is an historically incorrect use for the Brighton & Hove area. The street name has been there for over 30 years. It is the only street with that terminal name in the whole of England. Save the quirky “i” in Bond Street Laine! Stop this re-writing of history! The use of ‘Laine’ in this context is wrong and needs to be corrected. To allow it to remain is to perpetuate the ignorance and misunderstanding which there is about the use of the word ‘Laine’. It is not possible to fully understand Brighton’s past and the history of ‘North Laine’ if we do not understand the role of and the development of the five Laines that surrounded Brighton. If it does not matter then history does not matter. I am arguing for this change from two fronts; my family lived at 17/18 Bond St for over 50 years when we ran Mead & Co Auctioneers and Removers almost next door to the street in question. Also as I have a BA in Geography and an MA in Local & Regional History…and am working on a PhD in Brighton housing history…I feel I have an academic muscle to flex! A laine is a large open field …which this is NOT. A lane is a small footway which this palpably IS! I have contacted the council on several occasions about this but always assumed[as it was SO incorrect] that it was a private sign. Now we can do something about it. I agree with Andy, Peter and Geoffrey. The use of Laine in the name is incorrect with the local terminology for a narrow footpath. If Roy would like the footpath to have a unique name, then I suggest it should be called Bond Street Twitten. A twitten is a Sussex word describing a passageway/alleyway used by foot traffic between two streets, the name would fit in with the local character of the area and we all know Brighton has lots of twittens. From last night [26/7/2012] in the Argus: Following the preliminary hearing of this matter on 12 July, when dates for a full hearing were set, the Council had reviewed its position and had decided that it will not be pursuing the proposed change of name. This was accepted by the Magistrates today (26th July). The Council agreed to pay the £200 fee incurred. The Court had set a date for 1-2 day hearing in October, with three witnesses due to give evidence. The news that B&H Council are not pursuing the name change is indeed regrettable. I was to have been one of the three witnesses to give evidence and I was relishing using historical factual argument to refute this inaccurate appellation – the more so as of July 12th I am now Dr Mead! (Ph.D Geography) and wanted to say so in public! I would like to know why the Council dropped this case. Was it a matter of cost over historical accuracy?